Technical business services have a great capacity to support the creation of jobs for the youth and make farming more competitive and attractive to them. Young professional service providers can help smallholders to use recommended production techniques and inputs to generate higher incomes. To achieve this, these services must be viable for the service providers and the clients. 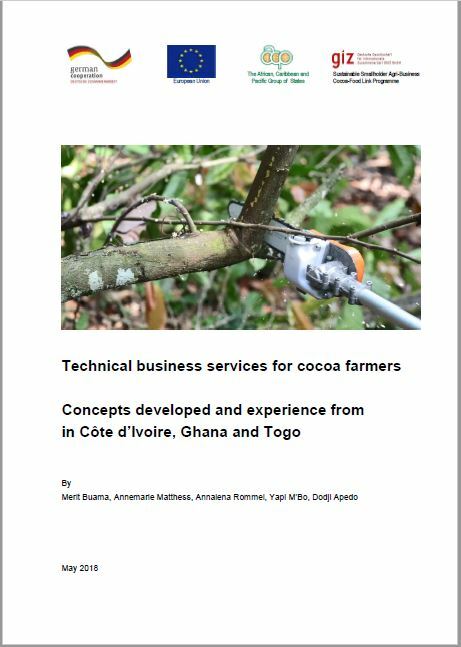 GIZ’s Sustainable Smallholder Agri-Business Programme and private partners provide technical business services for cocoa smallholdings such as for pruning, spraying and GPS measurement to scale. As of now, 175 young service providers have been qualified, serving more than 31,000 cocoa smallholders in Côte d’Ivoire, Ghana and Togo. Interested to learn about the tools applied and know-how gathered? — Have a look at the document!